MyUnity To Offer Interactive tweaking of the Unity Desktop - OMG! Ubuntu! 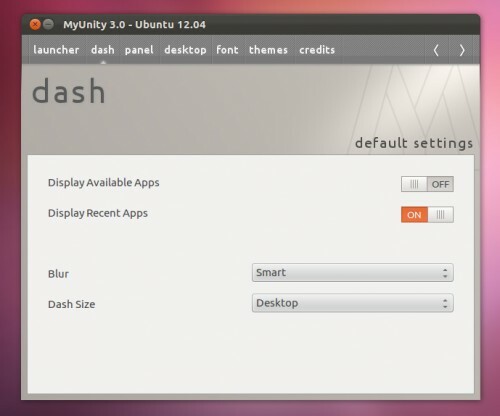 Small Unity-tweaking tool ‘MyUnity‘ offers users of Ubuntu an easy way to customize parts of their desktop – from the size of fonts to the colour of the Dash. Presently MyUnity follows the trend of most applications by using traditional checkboxes, drop down menus and sliders for option adjustments/selection. But plans on the table for the next version of the application, version 4.0, offers up an entirely different, interactive, and, in many ways, intuitive, way of changing your settings. Rather than present you with a list of choices it offers up mini-desktop to which you apply the changes you want. For example, rather than check a box to enable desktop shortcuts you simply drag and drop the shortcuts from the MyUnity window. Similarly, to resize the launcher you just ‘drag’ out the launcher on the mock MyUnity desktop. This interactive approach is best seen in action, which you can do in the video below. The interesting stuff happens around the 35 second mark.